‘Tis the season for giveaways, and I have 3 copies of Camilla’s Saulsbury’s new book “Shortcut Cookies” to give to 3 of you. To win a copy of the book, just leave a comment with your favorite cooking or baking shortcut. I’ll pick 3 at random and email the winners between now and October 19. So you have a week to enter. 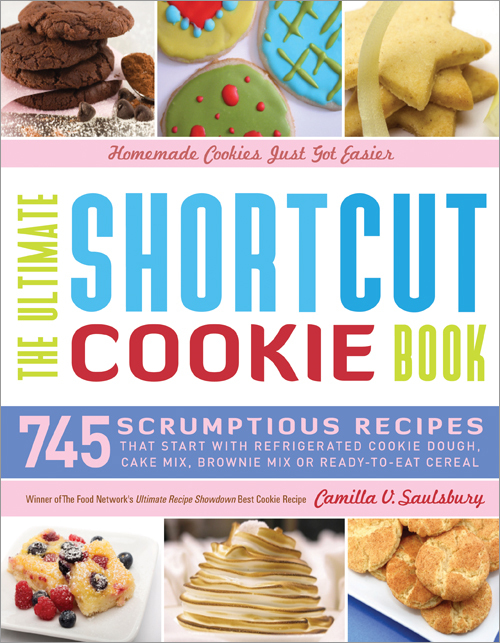 With over 745 recipes for cookies starting with packaged doughs, mixes, and cereals, Shortcut Cookies is one of Camilla’s best books yet. And given her penchant for perfection, you can be sure anything Camilla’s tested will be delicious enough for the school functions, bake sales and friends. Some stand-outs from the book include an Italian Cheesecake Bar made with refrigerated sugar cookie dough, ricotta cheese, and traditional Italian flavorings of orange, golden raisin and hazelnuts; Lemon Curled Swirled Cheesecake Bars made with a packaged lemon cake mix base; Mango Cream Bars, with a crust of crushed gingersnaps and cream cheese & fresh lime topping and a recipe called “Dad’s Double Peanut Butter Frosted Brownies” made up of a brown sugar doctored brownie mix and topped with Camilla’s homemade peanut butter frosting. My favorite chapter is always “Brownies” and Camilla has a bunch including Turkish Coffee Brownies, Whiskey Brownies and Aztec brownies which I will review very soon. And finally, leave it to Camilla to take things to yet another level. Over on her blog Shortcut Cookies, she’s taking recipes from the book and making them with all-natural and gluten free mixes. And of course, she’s there to answer questions as well. Now it’s time for you to win the book. As stated above, all you need to do is post your own cooking or baking related shortcut. I’ll be picking winners randomly. Here’s a shortcut I use when baking when do rolling out my pie crust I sprinkle salt on the butcher block and it makes all the dough come off much easier none of those soggy dough balls that are so hard to pull off. The quickest and easiest cookies ever! 1 cup p-nut butter (creamy), 1 cup of sugar and 1 egg. Mix and drop on cookie sheet and cook at 350 till your desired consistency. They will amaze you as they always turn out a dozen perfect homemade pnut butter cookies. This is my favorite quick and easy trick. I got this recipe for a lady at work. Make the pudding at let it stand for 15 mins to cool. Mix pudding with cake mix and flour. Pour in 9×13 pan. Top with Skor bits, Bake at 350 for 45 min. The last time I made it I only had a Chocolate cake mix and Banana cooked pudding. I put banana pieces in the pudding and topped with chocolate chips instead of Skor bits. The best chocolate cake EVER!!! I concur with making the cookie dough, wrapping it in wax paper, then foil, label and date and into the freezer it goes. Slice and bake as needed. Know those wonderful decorated cookie bags, do yourself and your budget a favor. Purchase after the holiday, store and use when needed the next year. But red after Christmas, use for Valentines. Orange for Halloween and Thanksgiving. I remember back when I was younger and my mom would make two layer lemon with chocolate frosting cakes for Friday night dinner. Always with Duncan Heniz mix too (it’s the best, by far!). But, instead of oil, she would use apple sauce! Cuts out a lot of the fat/grease, and keeps the cake moist and delicious! You don’t taste apple, it just takes the place of the “purpose” the oil formally had. If raisins in a recipe must be plumped up before being used in a recipe I always use the ones that I have prepared in a glass mason jar in my cupboard. Here in this jar I keep some of my raisins in rum so that i can use them whenever a recipe calls for plumped up raisins. The resulting taste is worth not drinking that little bit of rum! Use room temperature eggs when making cookies, if the cookie dough is too runny then refrigerate until it firms up, and be the first one to lick the bowl! My favorite cooking shortcut is to keep cooked chicken on hand all the time. It´s so easy to make a meal when you already have the meat prepared! You can use it in a stirfry, for nachos, wraps, salads, with curries/other sauces, on pizzas, and anything else you can imagine! My favourite shortcut is a recipe from Hungry Girl: devil’s food cake mix + 1/2 a can of pureed pumpkin + 25 min at 350F = instant cupcakes with sneaky vegetables! Great for people like me who don’t like veggies but always have room for chocolate. I’ve read all the great shortcuts and ideas and can’t think of anything I do. I definately could use this book! My favorite baking shortcut is using my cookie scoop! The scoop gets the cookies even and similarly sized so I don’t have to worry about uneven baking. When I bake cookies I always line the pan with parchment paper. This makes it easy to slide the cookies off and the paper can be reused until I’m done with that batch of cooke dough. Clean up couldn’t be easier and you don’t have to constantly grease the pan. At this time of year, my favorite shortcut is for Pumpkin Chocolate Chip Cookies. You mix Spie Cake mix, 1 small can of pumpkin puree and a bag of chocolate chips. So yummy, my kids gobble them up. my baking shortcut is for boxed cake mixes. i like to use boxed cake mixes but i like for them to taste home made so i always add something in to make it taste different….for chocolate cake i like to add some cocoa powder, cocolate syrup or chocolate chips. for vanilla cakes i like to add organic vanilla extract or paste and for some fruit flavored cake add juice of that certain fruit…if its a citric fruit also add the zest… and for any flavour cake add apple sauce for a really moist texture. my cooking shortcut is an easy microwave chicken recipe. use chicken breast adn mix ketchup, soy sauce, and a little bit of brown sugar. put this mixture on both sides and put in the microwave…it will be ready in 6 to 10 min and it tastes really good! I have a group that gets together once a month to make freezer meals. We try to get atleast 16 meals in the freezer. Which may sound easy to some, but not so much with little munchkins running around!! We are so proud at the end of our session and for weeks to come as we enjoys the bounty of our mornings work. We are planning a cookie dough freezer session soon, I would love to have this book to get some great new ideas. I like to dredge blueberries in flour before I add them to a muffin recipe, it helps to keep them from sinking to the bottom! here is a great secret and treat for a diabetic or anyone who would like a fat free sweet. take a ‘ONE STEP’ angel food box mix and put it in a lg bowl. add one 20 oz. can crushed pineapple AND ITS JUICE. still till blended but do not overmix. spread in ungreased 9 x 13 for 20 to 25 mins or till done. i also store all my baking supplies in 3 lg totes because they are so easy to pull out when needed and everything is in one place. one of my favs is: bake a pan of brownies and as soon as they come out of the oven, sprinkle the top with JR MINTS. let it stand for 5 mins and then swrl them all over the top. i can never wait till they are cooled before digging in !! and dont be stingy with the JR MINTS !!! Around this time of year–every week when I go to the grocery store, I pick up at least one item I will use during holiday baking. That way when I go to bake christmas cookies, I have everything I need. Sure beats having to go out and shell out alot of money in one trip for cookie ingredients. Nice and gernerous giveaway. Thanks and congrats to whoever wins. When I know I’m going to have house guests, I spend a day in my kitchen preparing. I go through the recipes for each meal and prep as far as I can without actually cooking the dish, combining ingredients in small plastic zipper bags and then placing all of the bags for one recipe in a gallon-sized bag. I seal the big bag, write instructions on the label, and stick the whole thing in the fridge. This way I can serve homemade, fresh (not reheated) meals without sacrificing hospitality. My favorite baking secret is adding some type of pureed, shredded, or chopped fruit or veg to most of my baked goods. It adds extra flavor and nutrition. My baking tip is to buy slice and bake sugar cookie dough and and before I put the cookies in the oven I take an ingredients like crushed peppermint candy, M&Ms, chocolate chips, nuts, sprinkles, etc and press into the top of the cookie. They look So home made! I, like a couple of the others, use cake mixes for certain types of cookie recipes. Also, I use a cookie scooper and it saves me SO much time making the cookies uniform in size. I premix the dry ingredients of my favorite homemade pancake recipe and make enough of the dry mix for 5 or so pancake making sessions. All I have to do is add eggs and buttermilk, and I’m ready to fill up the griddle! You are making a cake, not gravy or custard, so there is no need to be obsessive about ridding the batter of all lumps. actually when you do this, you only ensure you will have a dense, heavy cake. Lumps in cake batter provide pockets of air which make for a lighter, fluffier cake. My favorite (healthy-ish) shortcut is using a box of Funfetti cake mix mixed with a can of Diet Cream Soda and then bake! Add fat free cool whip mixed with any add-ins and voila!!! I always leave my kitchenaid ice cream mixer bowl in the freezer, that way i don’t have to wait a whole day for it to freeze, I can make ice cream at a whim instead! I don’t know that I use or know of any shortcuts that others don’t use. I like to brown my bulk ground beef/turkey ahead of time and freeze 1-lb ziplock baggies of them in the freezer for easy spaghetti or potato soup. I am ALL about the less pans/bowls at a time, the better!!! Well, and this week when my MIL was over and made from-scratch biscuits for us, she taught me to wipe the counter with a wet sponge before laying down a sheet of parchment or wax paper to roll out and cut the dough. The wet counter-top prevents the wax paper from sliding around and making things difficult! My shortcut: turn off your oven 3-5 minutes before you take the cookies out. It’ll still be hot enough to cook them, but you save that much energy by not using the oven! I wish every home baker could have a digital kitchen scale for weighing ingredients. I finally got one this year and I can’t believe how much faster recipes come together, and there’s no frustration with having the correct measuring cups clean and handy. It’s also great for portioning out even amounts of batter for layer cakes, and for making evenly sized rolls and bagels. I know this isn’t new to you Anna, but it was new to me this year and I’m so glad to finally have a good digital scale in my kitchen! I add things to brownie mixes all the time – butter instead of oil, espresso powder, etc. I’ve only done this once before, but it got rave reviews: I replaced the oil and water in a cake mix with a pint of melted premium ice cream. I did chocolate cake with chocolate peanut butter ice cream, but the possibilities are endless! I always start making cookie dough in Nov. and label and put it in the freezer for Dec. baking. Ooo I am dying to get my hands on a copy! My baking secret is to continually try new recipes and share them with neighbors and friends. Then they all think I’m just the best cook ever…really, it’s just that I want to try everyone’s new recipes and I always find a few keepers! We love citrus in our home, and have citrus trees. I juice them and freeze them in ice cube trays. This way we always have fresh citrus for our lemon bars or key lime pie. Freezing the zest also works well! one of my shortcuts is to use applesauce in place of oil. I have homemade applesauce & it is so much healthier than oil. I even got brave & tried it in something other than baking & it worked!!! I make my own cookie dough rolls! Make cookie dough, roll into a log, wrap in plastic wrap and freeze! They’re perfect for when you want one or two cookies but don’t want to make a whole batch! Whenever I use a boxed mix, and it calls for water, I replace the water with something else. WIth lemon squares I use lemon juice, with brownies I use rum or kahlua, when I make red velvet cake I used pomegranite juice. It no longer tastes like a mix and the flavor is more intense. I keep all my basic baking indgredients in a bin that sits on my pantry shelf. When it’s time to bake I take it out and have most of what I need right there. When I’m finished it all goes back in one trip. My new baking secret is “Artisan Bread in 5 Minutes a Day”…. there is always fresh dough in the fridge for loaves, pizzas, sticky buns, you name it!! My family is so happy. I take a really good brownie mix – like Ghriadelli – and then plop spoonfuls of peanut butter on top and swirl them around. It looks homemade so people assume they are! My favorite baking secret is to always use sugar/brown sugar that has been infused with the remnants of my used vanilla bean pods. I keep one stash of sugar for “baking only” and that’s the one I go to. Economical and delicious! I never grease and flour cake pans anymore. Instead I simply spray with regular cooking oil spray and the cake comes out of the pan perfectly every time. This is especially handy for Bundt cakes. I like to make a basic sugar cookie dough and then add different spices, etc. to make a variety of cookies from one basic dough. I think my favorite baking trick is for rolling out cookie dough for cut out cookies. Instead of chilling the dough in a disk and then using lots and lots of elbow grease to roll out the dough while it’s cold, I roll the dough out between two sheets of waxed paper right after I mix it up, while it’s still soft and easy to roll. Then, refrigerate the ‘sheets’ of dough (Still between the waxed paper) until firm. Cut out your shapes, save the scraps and go again! When I make soft pretzel dough i put half of it in the freezer in a ziplock bag. my sisters always beg for me to make them these soft pretzels so when they want them, i just simply take the bag out of the freezer, defrost the dough, and then reshape and bake and its as if i just made the dough that morning. they dont really know the difference! Most recipes that call for nuts, call for toasting them first (and I also prefer the flavor of toasted nuts anyway). So when I buy a bag of nuts, I toast the whole bag of nuts in the oven and usually chop them too. Then I store the toasted, chopped nuts in a ziploc bag so they’re ready to go when I’m baking. It saves some time so you don’t have to toast nuts every time you need them. For pies, it’s helpful to freeze fruit when it’s in season and then you have it ready to go year round! My shortcut is lining my countertop with tin foil before I lay down my cooling racks. When i put cookies away and wash the cooling racks, I don’t have any clean up, just crumple up the foil, and toss! My favorite baking shortcut is allow my finance to do the baking while I do the cooking. He is a much better baker than me. Another shortcut I use in cooking is to pre-cut, the day before, all the vegetables that I will use for the dish and store them in the fridge so that the prep-work is done when I am ready to cook. I like Camilla’s shortcut tip on using cake mixes for some of her cookie recipes. My short cut in baking cakes is using bakers joy. I just love the stuff! When splitting cake layers, there’s no need to bother with toothpicks and knives. Just wrap a piece of heavy thread (or unflavored dental floss) aroung the cake where you want to cut. Cross the ends and pull both ends. Perfectly cut, and no sawing necessary. I know this sounds so lazy.. but my shortcut when I use brownie mix is to mix everything in the pan, that way there’s no clean up afterwards! My tip is to make a big batch of cookies and them drop them by spoonfulls on a silpat and freeze for later use. Makes baking a couple of cookies a breeze. It’s always worth making a double cookie recipe and freezing individual balls to bake whenever you feel like cookies! When rushed I prefer to make bars. Less time in the kitchen. I also use a food scale. For me it’s way easier to weigh the dry ingredients, than to get out measuring cups for all the ingredients. I always freezer the cookie dough from my cookies. It is great when you have people coming over at the last minute and don’t have time to make something in advance. The best cooking shortcut I can think of that I use is the pressure cooker. Cuts cooking time way down,and food is still delicious! Everyone begs for me to bring the pies at holidays or birthdays! I use Pillsbury piecrusts and canned apples, add in some apple pie spice, sugar, and butter. Super quick and easy and everyone thinks I slaved for hours! I love making mini cheesecakes. They bake up in just 15 min and you can mix up a variety of toppings and make 2 dzn so fast! Cupcake pans work well with liners if you don’t own the mini pan.Book looks wonderful! Oh man, I’ve never actually thought about it! I guess my best tip would be to line the bottom of a cake pan with wax paper and then spray the whole thing with Pam Baking Spray. The wax paper on the bottom helps you get all the edges of the cake cleanly out of the pan. Since I started doing this, my cakes come out perfectly every time! I use the tube sugar cookie dough as crust to fruit pizza, and premade chopped cooked chicken in stir fry. When making cookies, I make a double batch. I then scoop out the extra cookies, and freeze them. When I’m in the mood for fresh baked cookies, and don’t have the time, I just pop some out of the freezer and into the oven. No mess…just yummy cookies. Looks like a great book. I always make sure that I read the whole recipe through before I start baking. Sometimes there is a little twist or turn in the recipe and you don’t want to find out about it half way through. Another thing I always do is to write the date of purchase on my spices, baking powder, baking soda, etc with a permanent marker so I can always tell how fresh they are. I like to wash and chop up fresh herbs the day I bring them home and store them in an air-tight container or ziplock bag wrapped in a paper towel. That way I have no excuse not to throw them into a dish and reduce my chances of throwing out half of them by not using them in time. Keep up the great tips! Baking shortcuts? Hmm? I haven’t always done this, but DO find it VERY helpful when I get all the ingredients and measuring things out ahead of time. I’ve started trying to do that everytime I bake now and it really helps. One of my favorite “shortcuts” for all the ice cream I’ve been making this summer is when a recipe says to chill the mixture for hours and hours, I always put the bowl in an ice bath with a bigger bowl and stir it now and then, after about 30 minutes, the ice cream mixture is pretty chilled and ready to churn. Cooking huge batches of sauces, spice rubs etc. and storing or freezing. It’s not exciting but it does save time. I also love lining pans with parchment or foil to cut down on clean-up. I hate doing dishes! I chop up extra vegetables whenever I have time and store them in plastic containers. Then, I can pull them out of the fridge whenever I want for stir-fries, soups, salads, etc. I save time by doubling recipes and saving either the baked cookies or the dough. I also make mixes like cinnamon and sugar and keep them stored, ready to use, so I don’t have to make them, each time, I need them. An obvious shortcut: make sure the butter is at room temperature. And, when making muffins, use wax paper to line the cups–saves cleaning time and makes the muffins quite portable. I use a roll of sugar cookie dough as the base for my Lemon Bars — nice timesaver and it tastes great! This is fun, reading everyone’s shortcuts. They’re great. I agree with a previous commenter, one of my favorite shortcuts is coming to the Cookie Madness site and reading all the yummy recipes. Thank you for all you do, Anna. i use cake mix for many things as well! In late November, my family and I bake up multiple (up to 20) different cookie/candy recipes. Everything goes in the freezer when they are done. With each separate holiday party, or even just when I want to bring something sweet to work, I can easily go into the deep freeze and make a beautiful platter of lots of different sweets! It does get tedious baking for a couple weekends in a row, but definitely worth it in the end! i see this has already been mentioned, but the only shortcut i can think of is using the butter wrapper to grease the pan. sounds like a great cookbook! I also do this with apples and bananas that are about to expire. I use these in baking. They freeze very well and are so easy to pop into the mixer when needed! Same goes for lemon, lime, or oj in ice cube trays… perfect storage and amount. I love using silpat baking sheets for cookies. I have a small oven and can only cook one pan of cookies at a time. I alternate silpat sheets so as soon as one is done, I slide it off my cookie sheet to cool and then put the next sheet of dough on to the cookie sheet and into the oven. I speed up the butter softening process by cutting it up in pieces and I use parchment on the cookie sheet to help with cleanup! I love making bars and one of my favorite shortcuts is using a cake mix for the base of the bars. It’s very flavorful and can add a new twist to your favorite bars. during the busy holidy baking season i freeze cookie dough! i wouldn’t make it through the season without it! my baking/cooking shortcut..I like to use cake mixes to create easy/fast cookies. thanks for the opportunity to enter the drawing! would love to win as I have a young son who would like to become a chef/anything like this is right up his alley. My favorite shortcut is doubling up on recipes, shaping, and then freezing the dough for later use. It’s great to have something on hand when the kids, hubby, or me have a hankering for something quick and homemade. I love the simplicity of rice krispie treats. When I’m just making them for us, I pour them out on buttered waxed paper instead of in a pan and press it together using a second sheet. Less clean up! Also, for holidays I add food coloring to the melted marshmellow and press them into buttered shaped cake pans (ex. I use green food coloring and a tree shaped pan). I never have left overs at pot-lucks! When I have lots of baking to do for a catering job, I mix up all the dry ingredients and stick them in ziplock bags. At the job, I can the proceed!! I don’t really have any innovative baking shortcuts other than using mx for some of my recipes and Pam for baking. I usually make a bigger batch of anything I bake to freeze for another day. That way I have baked goodness whenever I want! My favorite low cal short cut is to add a can of diet soda to a box of cake mix and bake as directed. It’s low fat and you can experiment with flavors. Chocolate w/cola. Vanilla mix with orange soda, etc. I always bake pancakes and freeze them for quick, toaster breakfasts. I love using a boxed cake mix as my shortcut – from gussying it up into a super fancy cake, to cookies, to all kinds of things – it makes baking so easy! And tasty! I use the make a mix recipes that are usually for giving in gift jars. Mix them up in zip loc bags and leave for my teen kids to bake when they want a snack. Hello. I don’t really have many shortcuts other than rolling out dough between two sheets of cling film, to avoid getting my counter dirty and flour on every surface. It saves a lot of time and bother. Other than that I am not big on shortcuts, but would love to learn more about them! Always pop lemons into the microwave for 15-30 seconds befiore jucing — you’ll get lots more juice! I use a melon baller to scoop out my cake mix into cupcake liners, less mess and much quicker. My cooking short cut is I take my green peppers from my garden and chop up/thinly slice and freeze so I can use my garden grown peppers in the winter. rolling out sugar cookie dough between two pieces of plastic wrap. I don’t have to put flour all over the pin and surface and mess with the dough sticking and lifting. And it’s easier to clean up. Prepping the night before, non-stick foil and brownie mix! For an easy but gourmet breakfast, I like to prepare a dry muffin mix (usually something plain and versatile) or pancake mix and write down the wet ingredients needed to actually make the batter. It makes it so easy to make fresh pancakes or muffins in the morning! Just add eggs, milk, oil, berries or chocolate and you’re ready to go. The best thing about this is, there are no preservatives and for those with wheat, dairy, or other allergies, you can control what goes in your food and what doesn’t. Your family will thank you! When I unwrap a stick of butter to use it in a recipe, I rub the buttery wrapper on my baking dish to grease it. Better than spray! I like to make homemade cookie dough and freeze it into “balls” so i can bake as many or few cookies at a time that I want. this way we can have fresh hot cookies anytime! I like to freeze dough so I always have it on hand, ready to go! This book loos GREAT! Parchment paper! I love baking, hate cleaning up afterward. Parchment paper ensures evenly baked foods (no burned cookie bottoms) and makes clean-up a snap. When making cookies i often make a double batch and freeze one batch for easy cookies anytime without all the fuss! I would LOVE LOVE LOVE this book! I always use ready made icing to frost my cookies. I use to make homemade but this way is quicker. Another one: when baking bread, I always put the yeast with lukewarm water in the bowl of my kitchenaid. By the time I have prepared and measured the ingredients, it has started foaming and I can dump the flour & other stuff right in the bowl while the machine is stirring! Boxed brownie mix. I have a cupboard full of it. My favourite shortcut is to measure dry ingredients into my mixing bowl the night before I plan to bake. The next day I have no flour canisters etc to haul out of the cupboard and it makes the process so much smoother and quicker. It’s especially helpful if what you’re making is for breakfast (like pancakes)! As a working mom, the weekend is my favorite time to bake. It’s always helpful to pre -measure, and clean up the dry ingredients on Friday night. When Saturday morning arrives baking is a snap. I don’t have much time to cook, so I always double recipes when possible so I have something to freeze. Lining every pan I use with foil so I never have to scrub them! My cooking shortcut is to keep the kosher salt that I use in cooking and baking in a small glass bowl by the side of the stove with a 1/2 teaspoon measuring spoon. When I need to measure out salt for baking or cooking, the recipes usually call for 1/2 or 1 teaspoon increments of salt. I was recently introduced to Pam for Baking (i.e., cooking spray with flour) – it saves so much time in greasing pans and it gets into the little corners of the pans better than I ever could manually. Thanks for this great giveaway!! I love to take shortcuts in the kitchen! I always line my baking sheet with non-stick foil or parchment paper when baking cookies…less clean up and I never have to use non-stick yucky tasting spray. If I am low on ingredients or feeling really lazy, I will use a box cake mix as a base for cookie dough. It turns out really well- just add in a bit of water, oil and 2 eggs (I can’t recall the exact measurements right now), then stir by hand. My favorite shortcut is to go to the bakery. . . . well, okay, how about using the inside of your butter wrapper to grease the pan. I always liked that trick. Mixing dry ingredients on a sheet of waxed paper instead of using a bowl. No need to dirty another bowl and it’s a cinch to gradually add your dry ingredients into the mixer. I am learning to use the microwave more and more in cooking – melt chcolate and butter and a small amunt of water or broth, etc. But I still think my best shortcut is calling for reservations!! I freeze cookie dough in little balls, and then bake when the mood strikes. Does this count? I like to sift my dry ingredients onto a cookie sheet covered with parchment paper. Then I can just pick up the sheet of paper and pour the dry ingredients into the creamed sugar/butter combo. Saves washing a bowl and you have the parchment paper ready for baking. I love to freeze cookie dough and make a pan at a time. Makes the house smell great and everyone gets a few cookies. I love my convection oven when I’m in a hurry. I don’t necessarily use it all the time as I have mixed feelings about the baking outcome with different recipes but it’s a time saver over all in a pinch. I have just bought a silicone cookie pan it makes small square cookies. I am using it for my fudge makes the perfect size of fudge. Wonderful shortcut. For baking drop cookies, I like to melt and cool the butter. This makes creaming the sugar easier (and I don’t need my mixer). It helps give the cookies a chewy texture and gives me an excuse to make them. This time of year, my favorite cooking shortcut is bottled chili sauce. My older daughter loves chili, so I make a big batch then freeze individual portions for future meals, and it goes a lot faster with the store-bought stuff. I also admit that my Thanksgiving pumpkin pie will have a pre-made crust. I love to bake just about anything, but pie crusts are not on that list! My absolutely favorite shortcut is for speeding up the time it takes to bring butter to room temperature. Just cut it up into little cubes. The more surface area that is exposed, the faster it warms up. For baking, I like just putting the flour on top of the creamed butter/sugar and mixing the dry ingredients on top of it. Saves a bowl and a little time. For pizza dough, I do a quick rise using the microwave…makes an all day process of homemade dough shorten to about 15minutes! Does freezing cookie dough count? i love the convenience of homemade cookies in a flash! When I bake a pie, I always follow a recipe for pie dough that yields 4 crusts, so that I can freeze two of the crusts and make another pie really fast on another day. This comes in particularly handy around the holidays with so many baking projects to do! Soda cake — take a box cake mix, and mix it with a can of Diet Coke/Pepsi for chocolate cake, or Diet 7-UP/Sprite for a yellow cake. In my experience, it makes the cake even more moist and delicious, plus it cuts the fat and calories down considerably! I haven’t checked into the science behind this…it may all be in my head, but when baking cookies, I beat sugar and butter for a bit then add an egg, mix it a bit and let it sit. It seems that the egg “dissolve” the sugar quicker therefore less time needed for beating. When using a recipe that calls for shortening & eggs, I break my eggs in the measuring cup first and then the shortening will slide right out with no mess or shortening left behind. My favorite shortcut is to use a boxed cake mix instead of making the cake from scratch. My shortcut is at the beginning of the week, I do all my chopping of vegetables (onions, peppers, etc.) and baggie them until I need them. My well-stocked pantry is my favorite shortcut. Because I have all the ingredients and supplies I need at all times, I am always ready to bake. I don’t ever have to put it off because I need to go to the market. I bake lots more often now. Just having everything on hand somehow makes baking faster and easier. My timesaver is to use rolled up refrigerated pie shells rather than homemade pie pastry. Like your blog! Thanks for the giveaway contest! i always melt the butter that i put into cookies or cakes, unless it specifies that it should be cold. it helps me stir it in better. I always place some pro-grip shelf liner under my bowls when baking or cooking– it helps the bowls not slip around while I am stirring or adding ingredients in! My shortcut is to read the recipes (starting with Cookie Madness, of course) instead of baking. I love to bake and cookies are my favorite, but my husband is pre-diabetic and can’t stay away from them when I do bake, so I can only bake for special occasions. So I have a long list of recipes I want to try some day…. I prep and freeze. If I’m making cookies and don’t want the whole batch, I’ll freeze in balls for a later use. Or if I am cutting up a vegetable that I know will go bad, I will cut up the rest and freeze. Finally, I also cook in smaller portions alot. Saves time, and then I can make something else sooner instead of getting sick of the same thing over and over! OH man! I would love this. Camilla’s Cake Mix Cookies has been my bible since my kids were born (ie no more time to bake from scratch!). I love making anything from her book! Starting with a cake mix truly makes the recipe a quickie. I have a Chocolate Cake cookbook that offers many ways to “dress” up a box cake mix. I have pages marked with names of those who have picked a favorite (for birthdays). I also utilize various manufacturer recipes on the web. Many allow you to search based on what you have on hand and it will offer recipes using that item. Boxed cake mix to start any fabulous cake recipe is my shortcut! I just add variations here and there to make it my own cake! My favorite shortcut baking technique is to portion out cookie dough and freeze the rest for easy access at a later time (or when in a rush/pinch). My favorite baking shortcut is to use boxed brownie mix and mix in goodies (peanut butter, cream cheese, marshmallows, chocolate chips, nuts) to spice them up a bit. The variations are endless! My favorite baking shortcut: use scoops to portion everything out in circles! My favorite shortcut is to keep logs and balls of cookie dough in the freezer so they are ready to go by the time the oven preheats. I like to make cookie dough in batches and then shape the dough into balls. Store them in plastic bag and stick in veggie drawer of the fridge. When you feel like a cookie after dinner it’s easy to make. When the oven is still warm from the dinner preparation I save energy on top of saving time. My mom taught me a great cooking shortcut, not necessiarily baking though…..brown your ground beef ahead of time and freeze in one pound packages…..then all you have to do is thaw or add to recipes, very quick! A baking shortcut would be to make cookie dough, only bake what is needed, and freeze the rest in spoonfuls to take out and bake later! Dried onions. Rather than chop fresh onions and get my eyes all stingy and watery, I like to throw dried onions into soups and other recipes. They work great and pack a ton of flavor. I like to use parchment paper for my cakes and brownies for easy release and clean up. Love my silpat mat for cookies and could not survive without my cookie scoops – all sizes. Also I have lots of measuring cups and measuring spoons and spatulas so I’m not washing them all the time when I make multiple types of cookies in one day. My shortcut is to start early. In October, when I make my Halloween cookies, I freeze sugar cookie dough and thaw as needed. It works wonders. I have two favorite shortcuts, and ironically enough, they both have to do with baking cookies. 1. For a quick cookie fix, I just use spice cake mix, canned pumpkin, and chocolate chips. Instantly ready to bake, low-fat cookies. 2. When I make a batch of cc cookies I put 1/2 the dough (up to 3/4″ thick) into sandwich baggies so I can pull it out later and break pieces off and cook them super fast! My shortcut is to leave all the baking to my talented daughter, Lorie (rice,beans, other fine things.typepad.com). Sure saves me a lot of time!!! I keep boxes of Pillsbury Brownie Mix on hand for when I need a quick dessert to take to work. They can easily be made with peanut butter chips & peanut butter icing, or swirled with cream cheese for cheesecake brownies. So versatile & a great time saver. Another variation on the “bake and freeze”…I make huge batches of cookie dough and freeze them in small sandwich-sized freezer bags. That way I can bake up a dozen whenever I want, but I don’t have to bake so many that I’m sick of them. I have to cook gluten free so my shortcut involves using a pre-mixed gluten free flour, it’s so much faster than mixing my own. an important baking shortcut is to turn off the oven for the last 5-10 minutes of baking, in order to cut short the amount of gas i use. the oven stays hot enough to bake perfectly, but i reduce my fossil fuel use and therefore my gas bill! Maybe not a baking shortcut–but measure everything first! Have it all set to go, so when the time comes to use an ingredient, it can just be dumped in. I usually do things the hard way, but if I’m in a real crunch, I will make cookies from a cake mix, which takes less than 5 minutes and they are very sweet. I have also made waffles from a cake mix. My favorite shortcut is for bread making… instead of letting my bread rise on it’s own (not easy in my kitchen come wintertime), I turn my oven on for a couple of minutes to start warming up, then I turn it off. I let my bread rise in the warm oven, and can cut out about a third of the rising time. I make slice and bake cookie dough in large batches, and then freeze. make the mess once, and eat fresh baked cookies for a couple of months. Make ahead and freeze! It comes in handy when you are in a pinch! I use parchment paper or “release” foil instead of buttering the pan when making brownies and cakes. It makes for easy lifting and much easier clean up. I get really frustrated when parchment paper curls up on my cookie sheet, so I spray a little cooking spray and it keeps the paper down! Voila! I check out Cookie Madness first thing every morning. Instead of browsing through cookbooks for new recipes, Cookie Madness saves me time because Anna has been right on the money when it comes to sharing recipes. I love to decorate cookies with colored coarse sugar. I only have to spread the thinnest coat of royal icing for the sugar to stick to, and voila! — pretty cookies. It saves me the trouble and time of icing them, and my kids think they taste better. Freezing cookies is a must in my house. There’s no way I could get all of my Christmas cookies done in time if I didn’t. I’m not really sure if that’s a shortcut or not, but it saves me time and sanity around the holidays. Thanks for the great giveaway. Every year for the last 20 I have hosted a Christmas cookie exchange. Great “short cut” to having lots of different cookies for the holidays, while only baking one kind. If you’re icing a cake, use the “cake icer tip” (as seen on The Cake Boss). It saves SO much time and you’ll have fewer crumbs in your icing! My shortcut is to make dry ingredient “mixes” of my favorite recipes. I measure out all of the dry ingredients for a particular recipe and put them in a zip-top bag with a label on it. When I’m ready to make cookies, brownies or a cake, I just grab a “mix” and add the wet ingredients. Saves lots of time when you have a lot of baking to do! At Christmas when I make lots and lots of sugar cookies, I have found it is much easier to use the Betty Crocker packet of sugar cookies and they are just as good! My favorite cookie shortcut is to use a cookie mix! You can always count on the cookies being soft ones! The garlic press is my favorite short cut – no peeling garlic or cutting it – just pop in a piece, crunch down, and instant deliciousness! I cook rice or noodles in chicken broth for extra flavor, then add a little grated asiago and lots of cracked black pepper when I need a quick meal or side dish. When we cook chicken or pork we cook an extra serving to use for another quick and easy meal during the week. I wish I had more shortcuts! I try to cook and freeze chopped chicken and ham for quick omelets or quesadillas. I also use parchment paper and aluminum foil to avoid washing my pans. Without question…….PAM!!!! C’mon, Anyonewho was raised up with the grease and flour method before glorious baking spray knows EXACTLY what I’m talkin’ about! No mess, no fuss, always come out without a hitch. HURRAY! Penzey’s spice blends. They are terrific and flavorful, and all it takes is a second to get perfectly seasoned food or a quick salad dressing. Instead of waiting for cookie sheets to cool down between batches, I run them under cold water for a few seconds then towel dry. The cold water cools the sheet down in no time so you can use it for another batch without waiting. Ever since Nigella Lawson showed me the light, I’ve ditched the double boiler and always melt my chocolate in the microwave. If you’re careful and stir frequently, it does a great job. Parchment paper! Baking cakes has been so much easier ever since I started using it. I love your blog, read it daily. I always use a little vanilla about a teaspoon in everything that I bake as it improves the flavor of all baked goods even if the recipe does not call for it. I also wash up as many dishes as possible as I go along so the chore does not seem overwhelming at the end of the process and makes cooking and baking even more fun. my favorite is to do prep work for dinner at lunchtime or even after dinner. I get everything chopped, measured and ready to go. That way when I’m pressed for time and everyone is crabby with hunger, dinner is on the table that much quicker. I was taught by my father-in-law to use milk instead of an egg wash to make the pie crust come out looking golden brown and delicious. Its quicker, easier, and less wasteful! Whenever I’m in a hurry to bake and I don’t have softened butter to cream with the sugar, I place the butter in the microwave and defrost on the lowest setting for a few seconds. I check it periodically to make sure the butter doesn’t start to melt. It makes creaming the butter, especially by hand, much easier! When making apple crisp, I use a Pyrex pie plate and microwave the apple mixture until it’s partially cooked, then add the topping and finish in the oven. I like to purchase grocery store rotisserie chickens for meals that require cooked shredded or diced chicken. It helps on clean up and also if I need to be out and about I don’t have to worry about having the chicken prepared before I actually prepare the casserole or whatever for baking. I also spray my measuring cups with cooking spray prior to measuring sticky ingredients such as molasses or honey. It really makes it easier to get it all out of the cup and also makes for easier clean up. Speaking of clean up, I will also rinse my bowls, utensils, KitchenAid paddle, etc …. during the cooking process. Then, once the cake is in the oven or the dinner is simmering on the stove, I can quickly wash my things up and it takes no time at all. i use peanut butter as a “sauce” with noodles — throw in a bit of soy sauce, you have a not too shabby imitation of chinese sesame noodles! What a fun cookbook! I like to use rotisserie chicken from the grocery store any time I need shredded chicken. It’s convenient and tasty. My favorite tip is for decorating rolled out cookies using commercial Cookie Icing (I use Wilton’s brand). To keep it at the right temperature for easy spreading, I use my slow cooker and place all the bottles of icing in the cooker set on low. It helps to place a dishcloth in the bottom of the cooker so that the bottom of the bottle doesn’t get too hot. This way I don’t have to keep going to the microwave to reheat the icing and I can keep it right next to my work area within arm’s reach. I always line a baking dish with foil when making brownies so I can lift them out and not have to scrub the dish later! My favorite shortcut is to start with a cake mix. And I think they make delicious cookies! I would love to win one of the books. I make things in mass quanitites. Like chocolate chip cookies, I will make double the batter, rolls them into small balls and freeze them. That way when i want a couple of cookies, i can take what i want and keep the rest in the freezer. They don’t take long to thaw, so it rocks. Also, w/ sauces for pasta, I’ll make tons of it, then divide the sauce into single serve portion tupperware cups and some larger ones for when I am feeding a few people. Then, the sauce either goes into the microwave or a saucepan to warm up. It’s super great for when i make meat sauce and want to make lasagna, to have the sauce already done. So nice! One of my cooking shortcuts is when I get a can of tomato paste, I pre-measure 1 Tablespoon portions, wrap them in plastic wrap, and stick them in the freezer. Anytime a recipe calls for tomato paste, I have them already measured and at an arms reach. When I make cookies, I only bake as many as I need, but I make cookies balls from the rest of the dough and freeze them. That way, I can have fresh-baked cookies when I want. When I make spaghetti sauce, I always brown the meat and then use traditional flavored sauce from a jar and then spice it up with my own “special” ingredients to make it “homemade”. My family loves it! I also buy precooked and seasoned chicken when making chicken noodle soup on a busy weeknight, it saves a lot of time and also adds a lot of flavor to the soup since it’s already preseasoned. Just making sure I HAVE all the ingredients BEFORE I start helps! I’ve had too many times where I had to run out to get something because I thought I had it – and I didn’t ! When using the bottom of a glass to flatten cookies, spray the glass with a little nonstick cooking spray. Doing so makes the flattening easier and less messy! I season ground turkey as soon as I get home from the grocery store and form into patties so I always have a dinner option ready for me when I get home from work too late to cook a meal. Its easy to season each patty with something different so I have more than one option too! I use frozen all-butter puff pastry as the base for tarte tatin. It’s the middle of the apple season and with the pastry ready, all that needs doing is to make caramel, then pop the apples into a tin, cover with caramel and pastry and bake until golden brown. Perfect now that it’s the apple season again. my favourite shortcut is using parchment paper when baking a large batch of cookies. instead of having the wash the sheet pans in between batches, i simply slide off the parchment ( with hot cookies on it) onto a cooling rack. saves a lot of time. I use parchment paper to make a bag for cake decorating or anything else I’m piping, such as whipped cream or stuffed potatoes. I cut a piece of parchment 12-18″ long, depending on what I’m piping. Then make a funnel out of the parchment with the center of a finished edge as the point. The point should be closed as the piping tip will be dropped in, the frosting or whatever added, the wide end of the funnel will be rolled up, then the paper at the point end is gently peeled away to reveal just the tip. When you make the funnel, it should be a couple layers thick to give it some support. I’m right-handed so when piping, I rest the bag in my left palm with the tip between my thumb and index finger. I have my right hand on the rolled edge of the bag and as I use the frosting, continue to give pressure by rolling down the bag. When I’m done frosting, I peel the tip from the bottom and the rest of the frosting mess gets thrown out. I make my own chili and taco seasoning. I used to measure out all the ingredients at the tme that I was making that particular dinner. Now, instead, I make about 4-5 batches and place them in sandwich bags, then I wrap each one in foil and store them in the kitchen cabinet so they are ready when I want to make tacos or chili. This book looks like her best – I love the recipes that Camilla has posted on Facebook and I WANT THIS BOOK!!! My favorite cooking tip is for slicing cherry tomatoes: place a handful of cherry tomatoes between two plastic lids and slice between the lids for beautifully halved tomatoes! I like to keep pre-toasted pecans in my freezer, so I speed up my baking process. I toast a bunch of them at a time so I don’t have to stop and do that when I’m baking. Makes things go faster. They are also ready to throw into my husband’s whole wheat pancakes. My favorite shortcut is for rolled cookie dough, such as sugar or gingerbread cookies: divide the just-mixed dough into two portions and roll it out between sheets of waxed paper … then slide the flat ‘sheets’ of dough onto a baking sheet and place them in the refrigerator for 20-30 minutes. Then just peel off the top sheet of waxed paper and use your cookie cutters! The thin sheets of rolled dough are firmed & chilled quickly, and since you haven’t added any flour (by rolling it out onto a floured countertop) it doesn’t become tough and dry when you re-roll the scraps. Soup Base Shortcut: I keep V8 juice on hand at all times and use it as a base for lots of soups. It’s like having vegetable stock and tomato in one handy little container! The low sodium version is ideal. I use store bought cookie dough instead of making my own. All I have to do is pop them in the oven and decorate. Spraying the inside of measuring cups with non-stick cooking spray helps sticky stuff like honey and corn syrup slide right out, plus you get a more accurate measurement. Cleanup is much easier too! I don’t have too many short cuts because I usually cook with my 7 year old twins…. I am teaching them the right way to cook and measure. But, I always measure everything first and break the eggs seperately into a bowl so I don’t ruin the whole thing with 1 bad egg…. yes, I have done that and learned my lesson. you can microwave pumpkin and sweet potato and they taste sooo good 🙂 its so easy too! My shortcut….follow Camilla’s recipes! Having met her in person at a couple of Food Network shoots she is an awesome cook. Can’t go wrong with anything she’s cooked up. This is a great book that everyone should have. Since I already have a copy If I win another I will give it away on my blog. Here are two shortcuts that you may find usefull. 1. Welding gloves make wonderful oven mitts. They withstand high temperatures better than the standard cotton oven mitts. Granted, they are not very pretty but they are cheap. I keep a pair next to the oven and another pair next to the grill. 2. Use a hard toothbrush to brush the zestings from your microplane grater. I like the quick soaking method for dried beans: Instead of soaking them overnight, I bring the dried beans to a boil, let them boil for 2 minutes, and remove from heat to let them sit for an hour. From here you’ll be at the same level of soaking as you would have after 8 full hours of soaking–so you’ll still need to boil the beans for a good hour–but this is a good method for those of us who don’t plan ahead! Sugar cookies and speculoos are my favorite! Still working on decoration though. I always spray my plastic storage containers with cooking spray to help prevent staining. Love your blog! Whenever I have a recipe that calls for egg yolks, I freeze the whites- then I always have them when I need them and there is no waste. I also freeze grated lemon peel. It retains its flavor and is a super time saving trick. When ever I make a slice-and-bake cookie, rather than halve the recipe because it is only myself that I experiment-bake for, I portion the dough into smaller, single serve logs (a dozen or so cookies when sliced). Tightly wrap the cookie ‘logs’ and freeze them with the made date and baking instructions added to the ziplock. When I feel the urge for a fresh baked cookies, I just remove a roll from the freezer, slice and bake. Voila! No muss, no fuss …. just fresh-baked goodness. I freeze homemade or leftover sauce in ice cube trays and then pop them into a zip lock bag. So I always have sauce for pizza or Spanish rice and I only have to defrost as many 1/8 cup cubes as I want. When I make foods using bell peppers, I buy those previously cut ones from the frozen food section. they are just as healthy and they actually costs much less than fresh ones. when i make rice krispie treats i always like to make at least 2 flavors, i’ll make the plain ones first then the flavored ones 2nd that way i don’t have to wash out the sticky marshmellow pan twice! I keep a shaker of cinn/sugar and sprinkle it over the top of all my quick breads. I just love a crunchy top. I also use butter spray to prepare the pan, but instead of dusting with flour, i use powdered sugar!! Instead of freezing all the dough together, I form it into little balls and freeze it. That way I can bake just a couple cookies at a time. Rather than wasting paper towels or clogging the sink, I pour pan drippings into a can. When the can gets full, I throw it away. It saves a ton of grief later. Also, I make a layered quesadilla which cuts down the time of baking quesadillas for a bunch of people. My shortcut helps out in the clean up department. When measuring out peanut butter, I line the measuring cup with plastic wrap. That way I can just throw the wrap away and not have to spend so much time trying to clean up the peanut butter mess. This also goes for measuring out shortening. Using applesauce in place of oil makes the cupcakes that much less bad for you. Which means you can eat that many more! I hate waiting hours to make dozens of cookies so I always make half of the cookie dough and put the other half in the freezer for another time. As a busy college student, I don’t always have time to bake, so I don’t keep many perishable baking staples around. Initially, this made the occasional sheet of cookies or pan of brownies even more difficult, as I had to take more time to go to the store and search out ingredients- sometimes expensive ones, too. This has made baking easier, less expensive, and…a challenge! Imagine my delight when I found your Frito Candy recipe…the boy had a whole bag of slightly-stale fritos he refused to eat! Why put them to waste?…. I find that a food processor works better and faster than a pastry cutter ever does. It also means I can use frozen butter, which I think makes the dough soooo much better! Nice giveaway! My favorite shortcut when it comes to baking is making a quick chocolate ganache for ice cream or on top of cake. Semi-sweet chocolate chips, cream and a little corn syrup. Zap in the microwave and you have a great and quick sauce! It better then the store brands with all kinds of unnoticed ingredients. When I buy hard cheese like parmesan, I put it in my food processor to grate. I then put the cheese in the freezer – it’s always fresh that way. I also discovered if I wrap my cheddar cheese etc. in parchment paper and then us my FoodSaver vacumm it stays fresh for months in the refrigerator. I had some swiss cheese that lasted about a year that way. The only shortcut I really use is what someone else stated above – to microwave the butter for a few seconds when recipes state that room temperature butter is needed. When I’m going to use the crockpot and know that I’ll be gone longer than the usual cooking process of 8 to 10 hours, I will make the meal overnight in the crockpot. Some dishes just don’t taste that great when they are cooked too long. I just refridgerate and warm it up when I get home. I use Betty Crocker sugar cookie dough for pie crust when making mini-tarts. works great! My shortcut to making any chicken based soup is to buy and shred a $5 whole roasted chicken at Costo and combine it with Kitchen Basics chicken stock. The stock is rich, and the shredded chicken adds tons of delicious flavor. It really saves HOURS on prep time! Plus, I can always get a second meal out of the chicken (chicken enchiladas, pasta with chicken, pulled chicken salad, etc). I know this goes against the “religion”, but Instead of using unsalted butter and then adding salt, I find using salted butter is just the same or sometimes even better if you are making things like caramel. A little salt brings out the flavor in so many desserts. Occassionally when I see a sale, I use Ghirardelli brownie mix. I always add a large pinch of salt. Makes the brownies taste llike I made them from scratch. I love using mini muffin pans to make cookies. They stay soft in the middle and are fun just to pop in your mouth. Whenever I bake I try to have all my ingredients at room temperature. I don’t always plan ahead so if I’m short on time I will soften my butter in the microwave and place cold eggs in a bowl of warm water. The room temp eggs always give a better texture and final product. When I am short on time, I bake cookies with minimal ingredients like the 3-ingredient peanut butter cookies, Palmiers with pre-made phyllo dough (just add sugar), or shortbread using butter, sugar, and flours (all-purpose and rice). Easy and delicious. In our house, there’s just my hubby and me, so if I bake a whole batch of cookies, they often go stale before we can finish them. We don’t particularly care for the taste of cookeis after they’re frozen, so I freeze the dough instead. I freeze it in small containers. Then, when we’re feeling like “Cookie Monster”, I take out a container of frozen dough. By the time the oven is hot, the dough is soft enough to scoop out. My favorite shortcut is to prepare extra of things like shredded zucchini, pumpkin puree, chopped nuts, stewed tomatoes,etc…to keep handy for next time. I do have to say that I love the idea posted here a couple times about freezing the cookie dough for fresh cookies later. My only real shortcut is keeping a well stocked pantry. I rarely find myself out of an ingredient for chocolate chip cookies, homemade brownies, pancakes, etc. Speaking of pancakes, I have a great recipe for them, and the batter will keep a day or two in the fridge, so you can mix ahead of time or simply make more another day. Precooked pancakes will keep in the fridge or freezer and taste great warmed up in the morning. When I need a quick glaze for a cake sometimes I microwave a can of frosting. The canned frosting is convenient and the melted frosting glazes the cake nicely. Purchased frozen puff pastry means a quick dessert or appetizer is only a few minutes away. My favorite baking shortcut is that I use a homemade cake release on my pans when I bake cakes. You just mix equal parts oil, shortening and flour and slather it on the pan. No need to do shortening then flour. Best of all, the cake release keeps forever in the fridge and nothing ever sticks! My favorite shortcut is simply two for one. I always try to make enough for two meals and freeze one. I always have something quick and easy for my husband on the nights I work evening shift, or the nights when I just don’t feel like cooking! When I need softened butter in a hurry, i put it close to the preheating oven- it warms up in half the time! I measure the dry ingredients for a couple of batches of pancakes ahead of time and store them in zip-top bags. All I have to do is add the wet ingredients. It’s helpful when my brain’s a little fuzzy on weekend mornings. Just as quick as a mix, but much better tasting. I also freeze stuff like marinara and meat flat in zip-top bags so it’ll thaw faster. Takes an hour or less to thaw in a sink of cold water. When I make a pie crust from scratch, I try to double the recipe and freeze the extra ball of dough for later. I have 2 short cuts. I use the microwave to take the chill off butter if I need room temp butter. I micro it at about 3- 5 seconds and just keep flipping it over. I leave the wrapper on when I do this. My other is instead of sifting dry ingredients I use a whisk. I put the dry ingredients together in a bowl and whisk it all around. So much faster! I mix up big batches of homemade pancake mix and pizza crust mix. When it comes time to bake all I need to do is weigh out what I need and add the wet ingredients. my favorite short cut for cooking is to chop everything for the week ahead of time! Adding just a *hint* of kosher salt on top of cookies. If a recipe calls for softened butter and I don’t have time to let it soften, I cut through the stick length wise once, turn it, cut it again and then slice it several times. The result is a bunch of little cubes that come to room temp more quickly. I take a shortcut by making cookie dough and then not baking it… kidding! When I’m too lazy to make cinnamon bun dough from scratch I buy those cans of pillsbury uncut sheet dough. I sometimes use boxed cupcake mix for cupcakes in a hurry then make the yummy buttercream frosting…the best part anyway! I love freezing dough and then slicing and baking whenever I feel like it. It’s instant cookie goodness! My favorite shortcut is boiling ground beef. As soon as I get it home, I boil it and bag up what I usually need for my recipes then throw it in the freezer. It makes recipes using browned ground beef so much easier! This is a roasting shortcut: when I make sweet potato fries or regular fries, I cut them into the right shape, toss with a little olive oil in a large bowl, then cover with plastic wrap & microwave for 5-6 minutes. After that I roast them for about 15-20 minutes. Overall, reducing the roasting time by about 20 minutes. This also works great with carrots & winter squash. my favourite baking short-cut: it’s for my favourite chocolate cake recipe. it uses a chocolate cake mix as a base, and then adds other ingredients to make it tasty and moist. my newest baking shortcut: this weekend, i modified another one of my baking short cuts. i made pumpkin pies with fresh pumpkin instead of canned (for canadian thanksgiving – gobble gobble!). i think fresh pumpkin makes a big difference in flavour. so, instead of using the canned stuff as my short-cut, i’ll cook the fresh pumpkins in advance and freeze them in the amounts i need for my pies. I try to make a couple batches of cookies at a time. I portion out the cookies and freeze the dough balls for later baking. I am never more than a half hour from a warm cookie, I like that feeling! my favorite cooking shortcut is to cook a bunch of chicken breasts in the crock pot. Then I shred/cube them and freeze them in 2 cup portions. Then I just have to do a quick thaw in the microwave before adding them to soups/salads/casseroles. I keep around ready made pie crusts and crecent rolls. You can always pull them out and make appetizers like cocktail weenies or fancy samosas. This is only a shortcut insomuch as it saves me a trip to the grocery store, but I frequently use lemon juice and milk as a substitute for buttermilk, which I rarely have on hand. I love using my food processor to do the shredding for carrots, zucchini, and cheese. Makes it soo much faster than grating by hand! My favorite cooking shortcut is by far the microwave! I use it instead of a double boiler to melt chocolate for so many recipes! To soften cream cheese, butter, etc. Use it for fast fudge! Use it for brownies in a cup and so many more quick desserts and baking shortcuts! Using the ready to go frosting! Taste is just as good…for the most part! My current favourite short-cut is having ingredients such as grated zucchini pre-grated and measured and stored in the freezer. This began as a way to store produce from the garden – but has been great for speeding up the baking process too! When II buy a big bag of walnuts or pecans at Costco I spread the nuts onto a cookie sheet and toast them. After they cool they go into the food processor for a little pulse action and then into the freezer. Believe it or not, toasting the nuts really makes a difference in cookies and brownies (and any other treat you’re making that uses nuts) and having them chopped and ready to go in the freezer makes it SO easy! I love using bottled key lime juice for key lime tarts, etc. – it is so much easier than squeezing the juice out of those little guys. I’ve also found my scale to be a huge time-saver when weighing ingredients! I like to try different kinds of cookies, but I don’t want to have to eat the same kind for days on end, so often I only bake a pan’s worth when I first make the dough. Then I scoop out the remaining dough onto a cookie sheet (placing them very close together to maximize the yield) and freeze the dough. When the dough is frozen, I put it into a zip top bag and freeze it until I’m ready to have that kind of cookie again. Not only does it keep me from having to eat the same kind of cookie for several days, it makes it easy for me to have freshly baked cookies when I’m short on time (or energy…).